A bad day for Newcastle United… | NUFC Blog. As the post mortem on Newcastle United’s transfer window continues amongst fans, with Mike Ashley and Derek Llambias failing in their attempt to fulfill Alan Pardew’s bold prophecy of a new striker at St James’, comes the unwelcome news that the FA will be charging Pardew for making inappropriate comments about about referee, Howard Webb, before the 20th August Sunderland game. The fan’s cup of bile has also been added to with the news that the iconic Newcastle United sign has been taken down, possibly to make way for yet more tawdry and sacrilegious Sports Direct branding at the Barrack Road temple? “The referee needs to make sure he referees the game from a completely neutral point of view because Joey has been in the press a fair bit this week – more than Joey would have liked and more than I would like – and I’m sure he’ll get a mention in Sunderland’s game plan. This (allegedly) contravened FA regulations forbidding managers to make comments on referees before a game. Pardew will be required to answer the charges before 4PM on Monday. 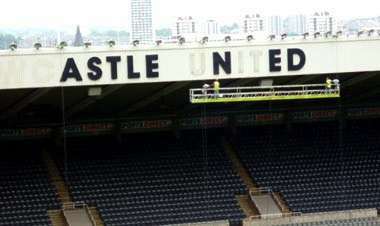 Meanwhile, in a move which has been circulating around the rumour mill for some time, it has been revealed that the famous Newcastle United sign which hung over St James’ Park’s East Stand is finally no more (see picture above), as Mike Ashley makes room for yet more promotion of his Sports Direct outlets in the worldwide shop window which is the Premier League. This step follows his move to crush dissent amongst the fanbase by breaking up the ‘singing section’ of the stadium on the pretence of making more room for families, and his failed attempt to rename St James’ Park, which was met with revulsion by some fans, and was completely ignored by the football world in general. No doubt, there will be more to come. According to one or two local journals, an unnamed and unqupted spokesman for the club has come out confirmed that the sign is coming down, but says it will be replaced with new, identical lettering. The pieces also add however that an also unamed, unquoted spokesman for the club could not confirm or deny whether any Sports Direct promotional signage would be added. there’s only one way to stop the fatman in his tracks & unforunatley that’s staying away from home games. once the money stops flowing in he’ll soon change his dodgy ways – there’s no gain without pain. , As they think I am stupid. @4 – i go me’sel & it’s not bad for 14 quid + their top of the league & most of the time it’s decent footy being played! they really need the bar (hole in the wall) sorted oot tho. “there’s only one way to stop the fatman in his tracks & unforunatley that’s staying away from home games. Roy, Ashley wants to promote his Sports Direct chain to a worldwide audience via the Premier League. Perhaps it would be better to sing about what a complete and utter rip-off his Sports Direct brands really are, with their shocking decline in quality and completely fake price reductions? Hard to shape into a qualilty tune like! worky that’s exactly what his game is – but i doubt it would do owt for his tacky business with an empty stadium on show. As soon as I heard those immortal words coming out of Lamearses spokesman David Craig “There’ll be plenty of strikers available in January” I knew we were fecked. Ruiz suddenly appeared on the horizon but, surprise surprise we’d left it too late just as we did with N’Zogbia or rather we didnt! £10m bid for Cisse but not for Maiga and all the usual tripe coming out of SJP about targets but nowt materialising because they think we’re all muppets and can be fed any amount of bullshlt. We, none of us, should have any respect for this administration as it has none for the fans. Until it deems it appropriate to explain where the money’s gone it’ll get no money from me even for the “away” tickets. FREE TRANSFER AVAILABLE – HE’S A STRIKER !! El Hadji Diouf leaves Blackburn Rovers!! Worky dont suppose you can get to this ? Anyone want to go on .orgs behalf ? Nothing will change until he off load’s the club……lets not forget his tried a couple of times already. Think how good another Sports Direct sign will look instead of ‘Newcastle United’…Also next seasons ‘No Fear’ home strip with Sports Direct plastered across the front. Wow. “Worky dont suppose you can get to this ? Thanks Andy. I’m in London but I believe that Thump may be attending on our behalf if it’s the Ashley radgefest at the Irish on Monday (that link didn’t work when I tried it). Aye Andy, I’ve seen it now, it is the Irish centre one. Worky @7 That’s exactly the kind of thing we should be doing! A kind of corporate terrorism, undermining his core business at every opportunity! I don’t mean anything illegal, just certain things that thousands of people united can do to ruin a company, in much the same way Greenpeace advocate toward corporations that act unethically, only this is much more important than a few dolphins getting crammed into cans of tuna! I’m sure we can think of things, boycotting St James’ Park is up to everyone individually, (I personally have gone that route, but understand those that wont/cant) but boycotting sports direct should be a matter of course, and if we pull together we can ensure that the whole UK boycotts his stores/brands. He’ll soon bugger off tail between the legs then! I feel a revolution coming on! Who’s with me? Isn’t it about time we heard from Pardew? Newcastle’s development has just gone back by 40 years. “If you think you’ve got a sore arse, you want to have a look at mine”! …Any decent manager would walk. Some good ideas there. Something must be done, however, to stop this guy decimating our club. Couldn’t we get all the UK Supporters Clubs to boycott Sports Direct? Decent fans do all stick together when someone is taking the p**s out of our national game and the genuine paying public. As far as boycotting matches I think 10,000 have already started that – how many more to follow? We could get the local charvas to do something productive for a change. Instead of hanging outside Shearer’s waiting for Sky Sports, they could hand around Sports Direct making no one want to go near the place. where is old “parnocchio”?,he’s never stuck for anything to say. “judge me at the end of the window”,you total mug,how stupid do you look now. as we speak he’ll be sitting in a room somewhere,with the “gruesome twosome”,getting debriefed on what to say,within the next few days. it just goes to show what these people are all about,the mouthy idiot hasn’t got the stones to face the press today,when other days,he’s pouring out his life story. pardew you are finished at newcastle now,your lying has caught up with you. i would think more of him,if he walked away,at least it would show he had some integrity. well it’s a 100% nailed on the snake will emerge from under his rock,with some fanciful tale within the next couple of days. anyone think during their face saving talks,the tack they could use,could be pardew falling on his sword? will pardew take one for the team? headlines in the chronicle;”BLAME ME”,newcastle boss alan pardew has admitted that the failure to land a striker,was in fact his fault. “i want the fans to know,i’m as frustrated as any one of them,but we looked at maiga,and decided he wouldn’t fit into our group”. “we had also looked at cisse,but freiburg wouldn’t sell,this approach was made before the last day of the window,and was misquoted by the press”. “our target was always brian ruiz,we were trying to keep it under wraps,but fulham got wind of it and made their approach”,we were always backpeddling after that,as brian spoke to them first,we just couldn’t get him over the line”. “we have had a good start to the season,BEST START SINCE 1996,we need to get behind the team. this will steer the recriminations away from ashley and llambias. whats enough is enough! I said it earlier how often do u forgive ur partner in relationship for lying? Well me maybe once or twice und i finish it! Bottom lime we all love this club and until ma is gone i wont support this relationship financialy anymore! Everyone says ap is the puppet of ma! Lets be honest as long as we go to games and pump money in we are all ma puppets! If u love ncl as much as i do then act and boycot ma! I really hope fans will organise for the mass boycott idea because it is the most powerful statement but another Idea if people are not going to do that could be to take JJB bags to games especially live televised matches and hold them up. If fatso wants to use St James’ Park as a source for his free advertising he won’t be happy to see 52,000 people advertising his most hated rival, just a thought. Ten thousand staying away from last home game the penny has finally dropped for some fans.The fat controller is killing our club knows nothing about football and how the hell he has become a success as a business man is an absolute mystery.Only billionaire owner to get his club relegated says it all really.Does anyone pine for the old days when we had class strikers like Booby shinsplints shinton and Billy had a rat for tea least we had a laugh then. Never been the same since Peter Withe left now there was a bit of class any of you lot know what he is doing now as last i heard he had been managing wimbeldon though that was ages ago. There are several varieties of range of credit score. Every person actually has several credit ratings for your range of credit scoring design due to the fact every one of 3 country wide credit bureaus, Equifax, Experian and also TransUnion, possesses its own database. Range of credit scores have various titles at intervals of in the various credit reporting agencies: Range of fico scores are widely-used through 90% of the creditors.